Vancouver’s Cage of Monkeys has announced that their first game, Quadra, is now available exclusively for the iPhone and iPod touch. Quadra is an addictive, fast paced Action-Puzzle game that anyone can pick up and play, and enjoy. Your goal is to remove blocks from a grid by forming 2×2 patterns of the same color. The more blocks you chain together the higher your score. The objective is simple in Quadra, earn the highest score possible by matching colored blocks before the pile reaches the top of the grid. 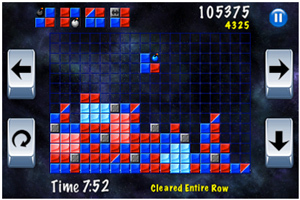 The more blocks you match, the higher your score climbs. Bombs and different Power-Ups have been added to change the strategy. With 3 modes and an increasing difficulty level for each mode, there’s always a chance to achieve a higher score. Quadra has a simple gameplay mechanic that hooks users quickly, becoming more difficult and challenging as they progress through the game. With 30 achievements and Game Center Leaderboard integration, see how you rank against your friends. Quadra 1.0 is only $0.99 USD (or equivalent amount in other currencies) and available worldwide exclusively through the App Store in the Games category. This entry was posted on Friday, November 4th, 2011 at 6:10 am and is filed under Casual, Everyone 10+, National News, New Releases, Puzzle. You can follow any responses to this entry through the RSS 2.0 feed. You can leave a response, or trackback from your own site.